…..and visit the HGTV Dream Home. …..when he returned from his run, he mentioned that he almost tripped over a piece of driftwood. Needless to say, he went back to retrieve that beauty. It has been in the garage until I figured out where I wanted to put it…. 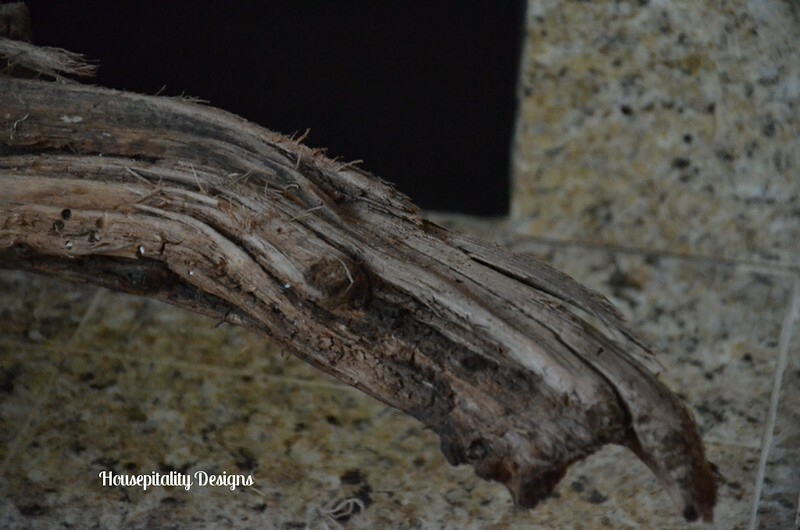 …..and when I read a post by Pat of Back Porch Musings…I knew exactly where that piece of driftwood would land. I love it here…Thanks Pat!! 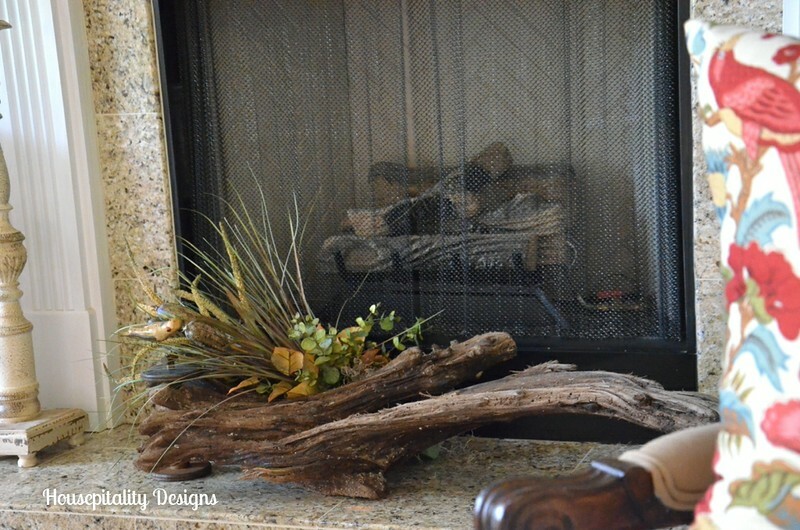 Pat placed her piece of driftwood on the hearth of her lake condo. Pat has impeccable taste, and I so loved where she placed her driftwood. It is so beautiful. I added some grasses and pods that I had in an arrangement. I love how it adds such great texture to this area. I am so happy that my hubby went back to retrieve that piece that he almost tripped over!! I have been busy this week preparing for and entertaining house guests, lifelong friends. 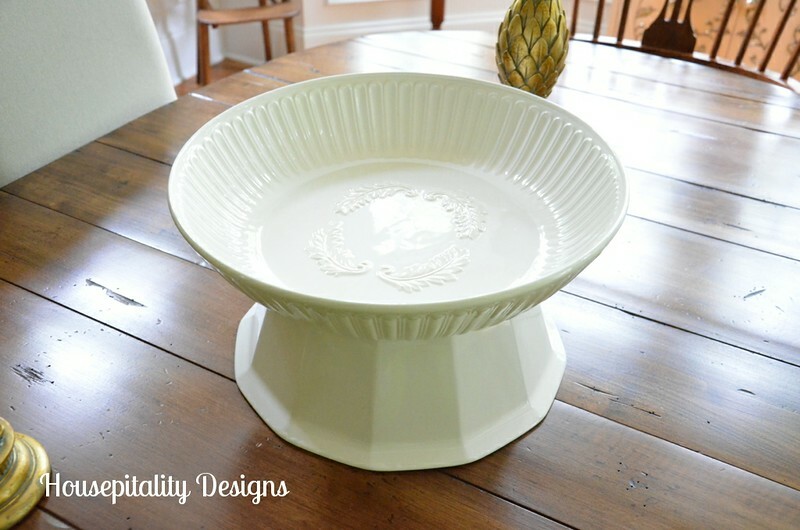 I turned one of the bowls upside down for a base and placed a shallow Lenox Butler’s Pantry bowl on top. 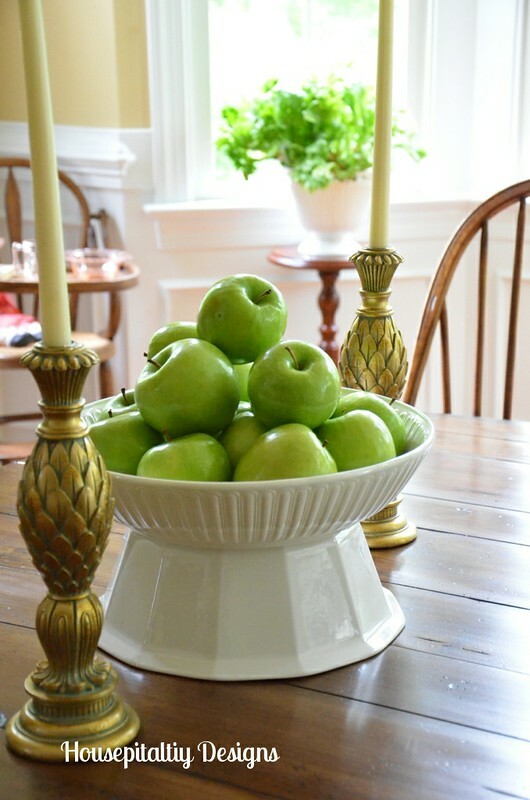 And it resulted in a pedestal bowl in which I placed apples in for a punch of color. 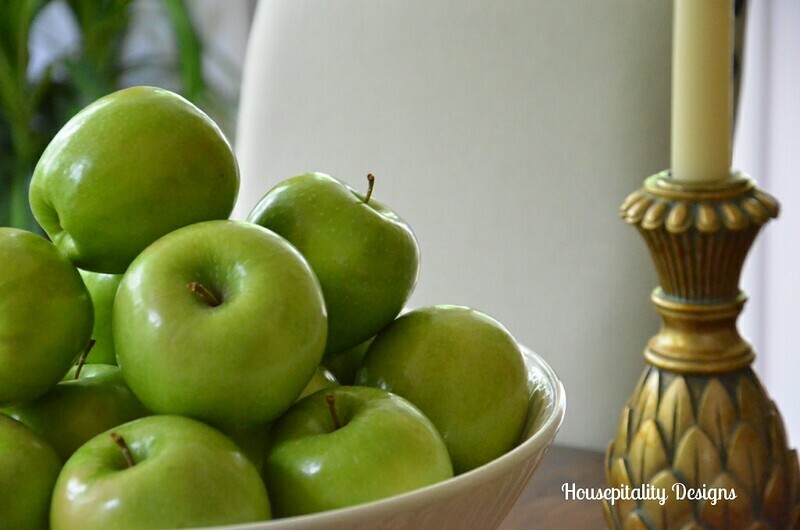 I love the color of Granny Smith Apples. However, it needed something else…a little bit of something “happy”…. …..I glanced over at an arrangement of daises, “the happy flower” that I just made for the guest room. And a few stems of daisies found its way to the dining room centerpiece. Adding the daisies felt right…bringing in another touch of white and green…this made me “happy”..!! Thanks so much for your visit and I hope will enjoy your weekend making “happy memories”…for I know I will be..
That piece of driftwood is so beautiful I just love what you did with the piece. I remember going to the beach in South Jersey and my parents always being on the hunt for driftwood to bring home. 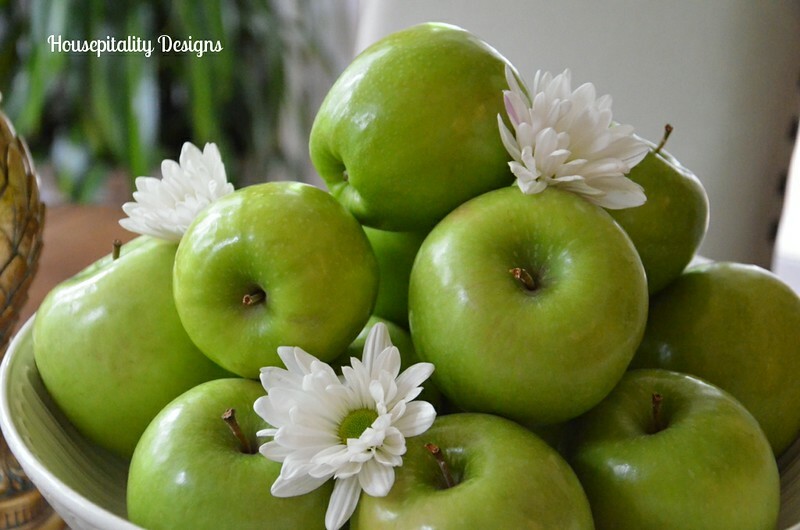 The centerpiece looks so pretty with the daisies in with the bright green apples too! Have a great weekend and spending time with good friends. Shirley, thank you so much! Your driftwood is beautiful. I love the embellishment. 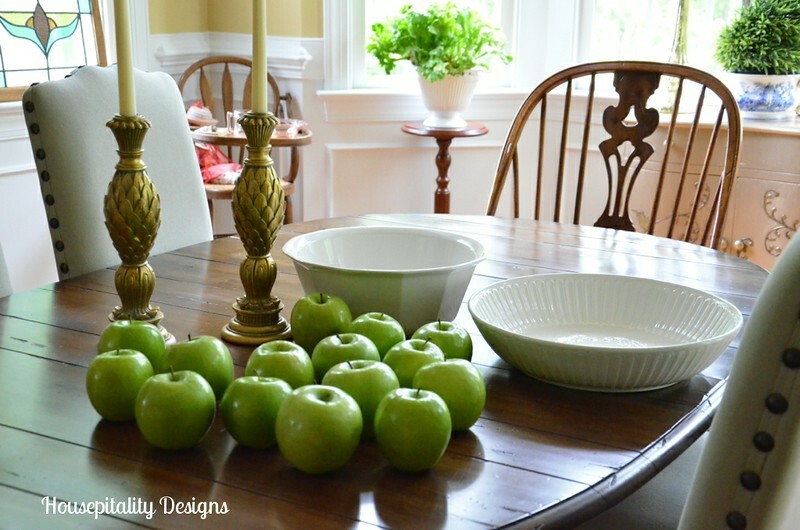 Of course, the green apples in white are a big hit with me too. Love the embellished driftwood and the centerpiece is perfect. Love the idea of one bowl stacked on an upside down one. Perfect replacement for the cake stand you don’t have. Shirley, the driftwood is so unusual! I love the way you added your special Shirley touch! 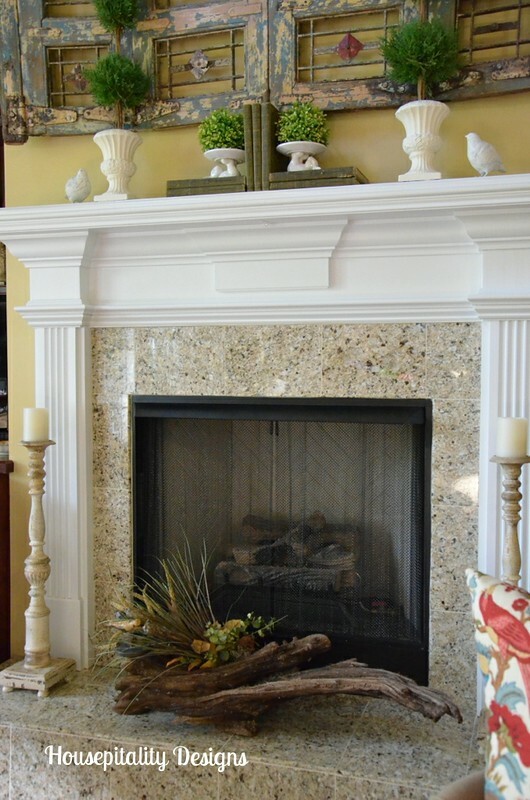 It looks great in front of your fireplace! 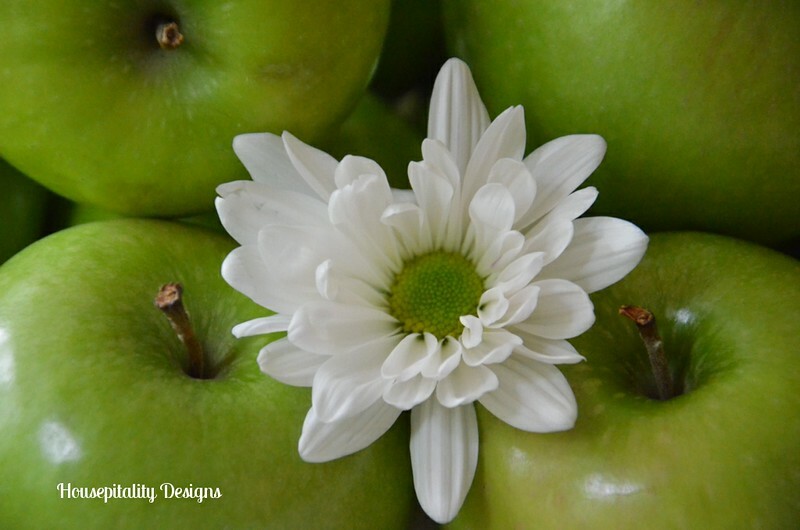 The centerpiece is lovely; the daises were an awesome idea to combine with the Granny Smith apples! Everything looks wonderful! I know your friends will love every inch of your beautiful home! Angela’s recent post…Cha cha cha changes! What a beautiful piece of driftwood and I really like what you did with it. 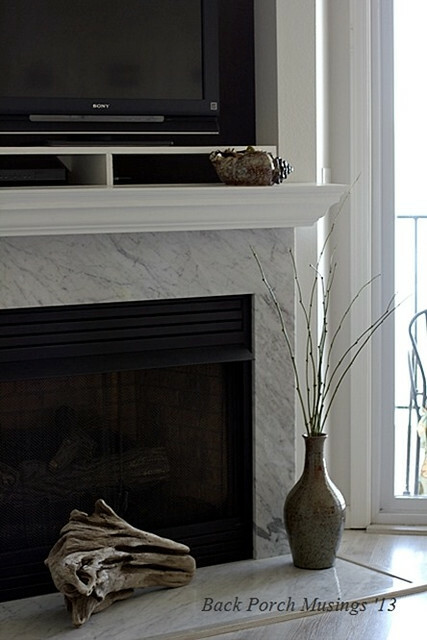 It really looks good on your hearth. Your center piece looks great on the table. Have a great weekend with your friends. Oh I love your driftwood. 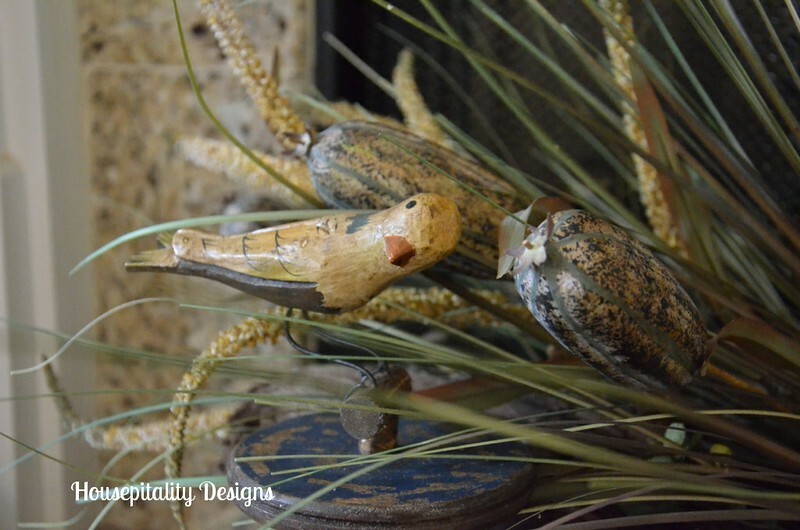 I brought home 2 pieces last summer from Lake Erie and they were so fun to decorate with. Your centerpiece is pretty perfect too. Hope you have a lovely weekend with your friends! Very nice! I like the addition of greens to your driftwood piece. The centerpiece for your table turned out really great! I like how the two bowls married up together so nicely! What are you going to do, Shirley, when you run out of projects? The driftwood creation is terrific and you were right suggesting to the hubby he retrieve it. Oh my gosh! It’s been so long since I’ve visited you that I didn’t realize that you had had your blog redesigned! The header is gorgeous and so YOU! That Kristy is really, really good, isn’t she? I love what you did with your piece of driftwood. It looks so wonderful underneath your fabulous mantel. 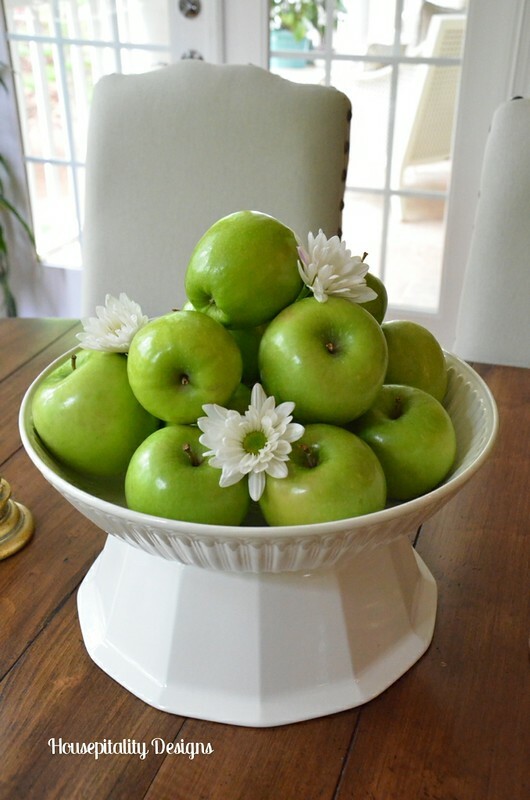 And those daisies are so cute tucked into your bowl of granny smith apples! Hope you are enjoying your time with your friends! What a find! Driftwood is so hard to come by anymore. I love it on your hearth and the embellishments that you added really bring it to life. 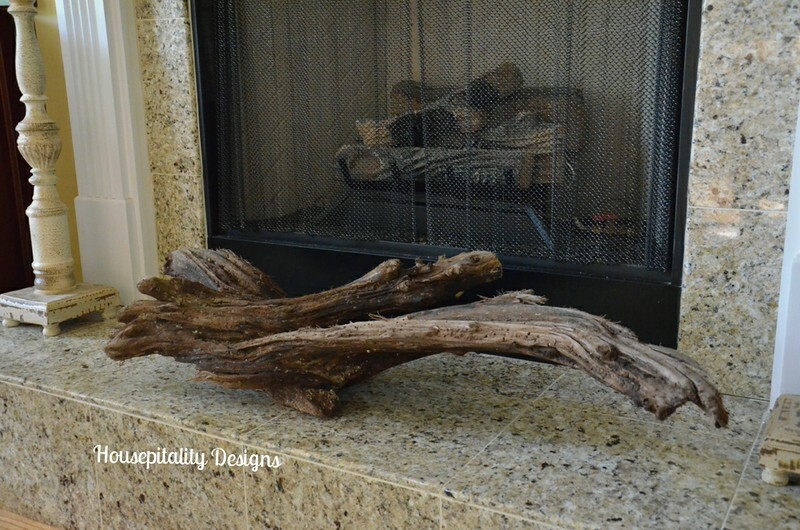 WOW, what a big and gorgeous piece of driftwood, that is truly a wonderful find! 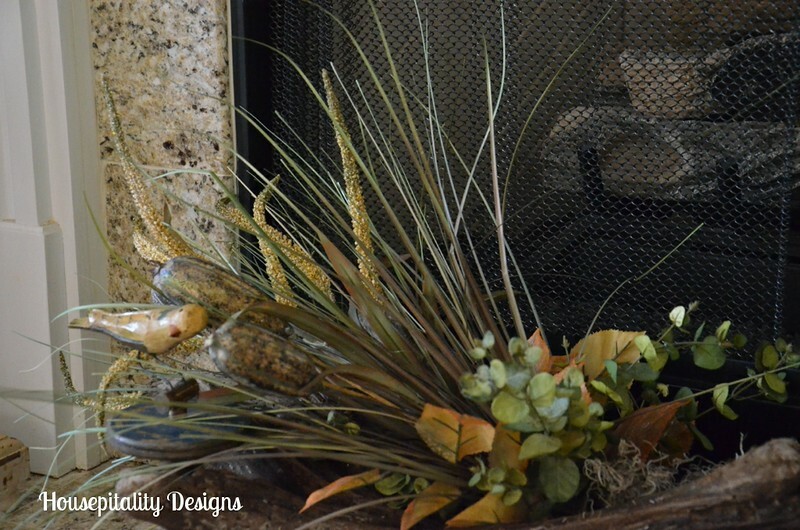 I love how you displayed it on your fireplace and your centerpiece is so pretty! Now that’s one great hubby – running back for that driftwood! What was he thinking passing it by – he should know you by now!!! 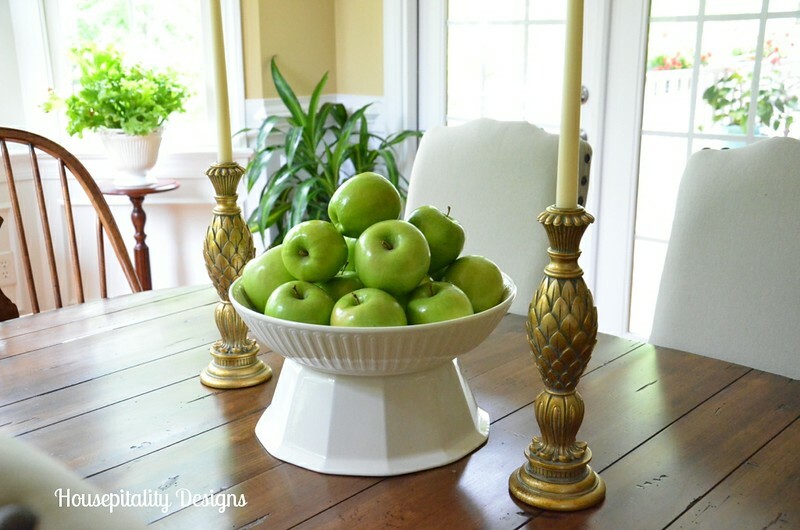 I love apples in a centerpiece – have fun with your friends! What a beautiful piece of drift wood. And what a lovely accessory it makes near the fireplace. I love how you dressed it up a bit. 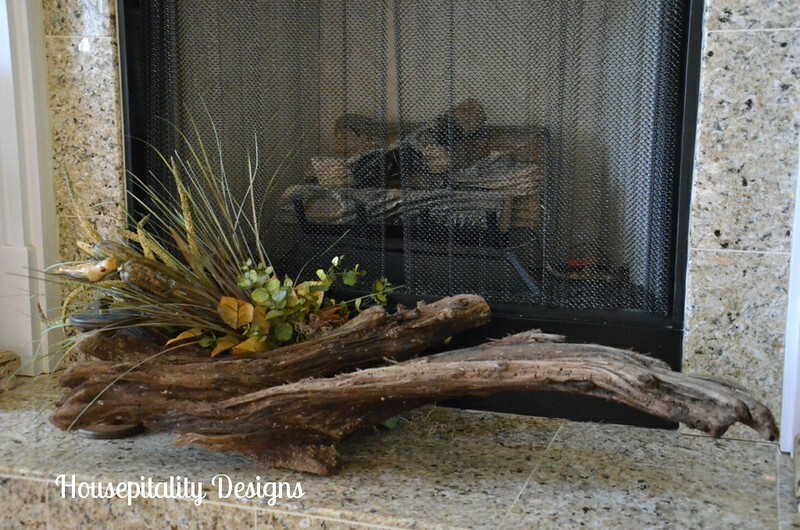 Wow, I just love what you did with the driftwood. Looks beautiful.